Actual photo that was posted on Craigslist; algae and all! 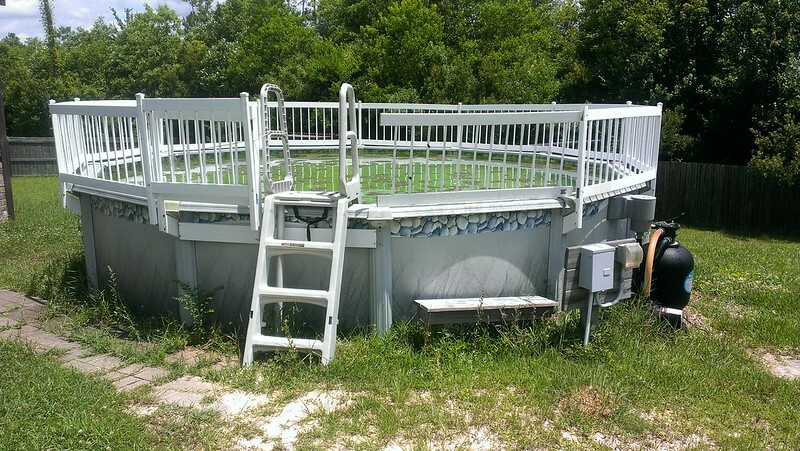 Did you know that if you post on Craigslist, "FREE Above Ground Pool ~drain it, disassemble, and haul it yourself" you will get about 57 responses in 15 minutes. No kidding! One response stuck out to me above the rest. It was all caps and read very happy. I'm not kidding... Here, I'll copy and paste it, "HELLO, PLEASE LET ME KNOW ABOUT THE POOL. I WOULD LOVE TO HAVE THIS. PLEASE CALL ME, I CAN GET THERE WHEN YOU ARE READY FOR ME TO. VERY, VERY INTERESTED. I CAN ALSO PAY YOU FOR IT IF YOU WOULD LIKE TO SELL IT. I THANK YOU SO MUCH FOR YOUR TIME. SANDRA THANKS AGAIN!!" Doesn't that just sound happy and genuine? I liked it. I actually gave the first respondent the first chance but I called and he/she didn't answer...so I called Sandra. Within the hour Miss Sandra showed up all smiles with her buddy to help pump out the water. I quickly realized that they were some serious pickers. I'm not hating! I'm a picking junkie!! I love stuff! I was a little nervous at first; careful about what I said...I don't know these people from a can of paint. They could be staking out my home, find the holes; murder me in my sleep! They were the nicest darn folks though! I mean, they even offered to come back and mow my lawn! (they couldn't believe we mowed our yard with a push mower ~in this heat ~with this slope) "It's all uphill!?" Sandra exclaimed. Ha ha, trust me, I KNOW! She tells me about her elderly mothers 9 acres that she takes care of and her buddy tells me about his "raggedy" ex-wife that moved him here from Illinois and his two year old grand baby... And they want to help Phil finish the fence, and they're pumping water out of the pool, and they're offering to come back and help mow the lawn with a zero turn... By the time it was all said and done, they got away with the pool, the kids playhouse that we've been trying to get out of our backyard, all the leftover lumber from the fence project, the box springs that were sitting at the end of the driveway awaiting trash pick up, the cb antenna that was poking out of the trash can, and a big hug from yours truly.